So your ground is narrow, but you would still like a stylish house… so what do you do? How about building a home in the shape of a triangle? This is a great way to maximise the use of space available to you, while also creating a unique and stylish home. This fantastic residence located in Tokyo, Japan that we visit today has all the elements of trendy modern living, from perfectly placed windows to minimalist decor. This designer home by the excellent team of architects at A-SA will definitely not disappoint when it comes to style and creativity! The house on triangle lot is located between two roads, and while the idea may have scared some architects and designers, this home is perfectly nestled into the space! From the outside the home looks strong and structured, almost hidden away from prying eyes in the neighbourhood. However, the façade is part of the designer aspect of this home, it is full of character, personality and charm. A home that we in fact cannot wait to inspect and enjoy from the interior too! Now let's take a look inside and catch a glimpse of the modern and minimalist style on display! The living room of this trendy modern home is simple and free from all knick-knacks and extra decorative pieces. It's a unique space with a few windows added for natural sunlight and ventilation… creating a comfortable interior. The comfortable sofa makes the perfect pot to relax with a good book and a warm cup of coffee on a chilly day, the space is accompanied by a fireplace, adding to the comfort and cosiness of this living room space. While the ground floor is the social zone of the house, the first floor is saved for the intimate and private quarters of the home! 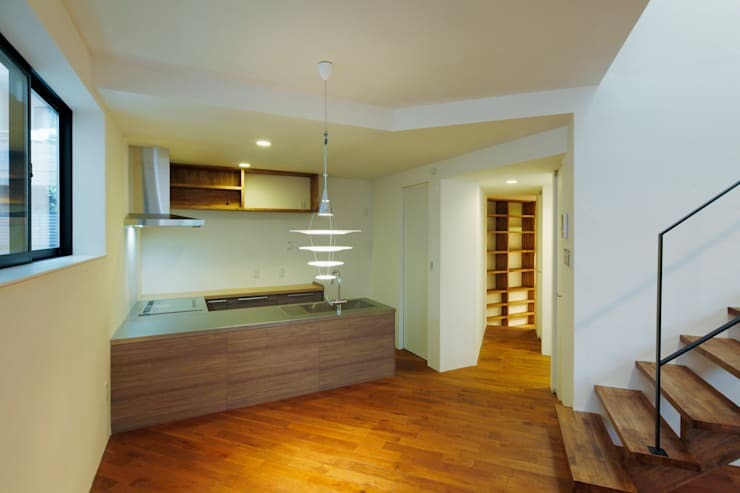 Across the living room, on the other side of the staircase is this elegant, yet minimalist kitchen! It's spacious, eye-catching and has the advantage of being an open space. The kitchen is yet to be filled with crockery and cutlery for that lived in look, but we love the wooden flooring and wooden counters. The simple stove along with the extractor adds a sleek finish to the space, while the lighting creates the perfect touch, creating a welcoming and inviting kitchen area. Add some bar stools for informal dining and you're good to go! So while this home has been perfectly decorated to look chic, stylish and minimalist in every way, this modern bathroom has not been forgotten. The simple use of all-white fixtures and fittings is a great way to create a trendy bathroom that will be stylish for a number of years. 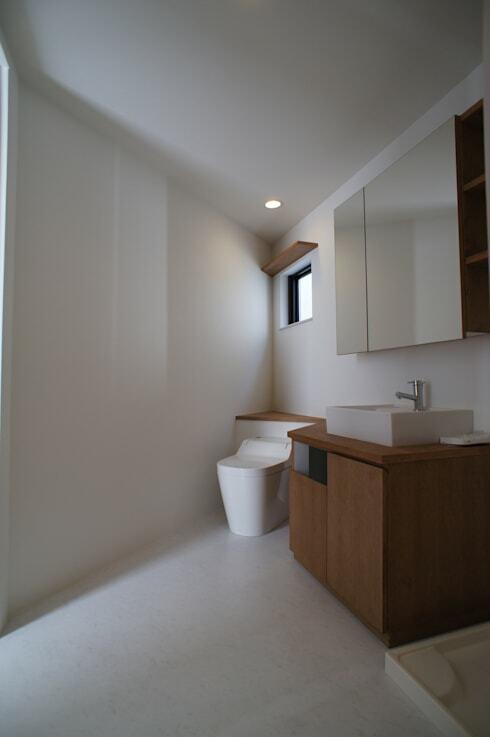 The placement of the toilet in the corner space, makes excellent use of the triangle effect that has created this unique and stylish modern home. Now how about that wooden bathroom cabinet and modern mirror, its great way to store your necessities, keeping your bathroom uncluttered. With the advent of entrepreneurs, everyone needs that comfortable space in the home where they can work in peace, while being comfortable too! 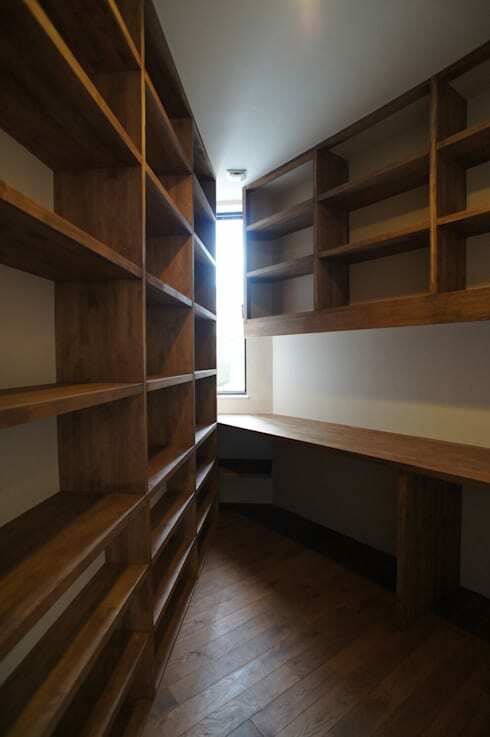 This office space has a large desk area, perfect for any kind of admin sorting along with a multitude of shelves. So if you need to store anything from your favourite novels to those invoices and receipts for tax purposes, these shelves will have your covered. There's even some fantastic sunlight peeping through from the corner, so you'll never be too occupied with work. We have come to an end of this fantastic tour of the triangle house. 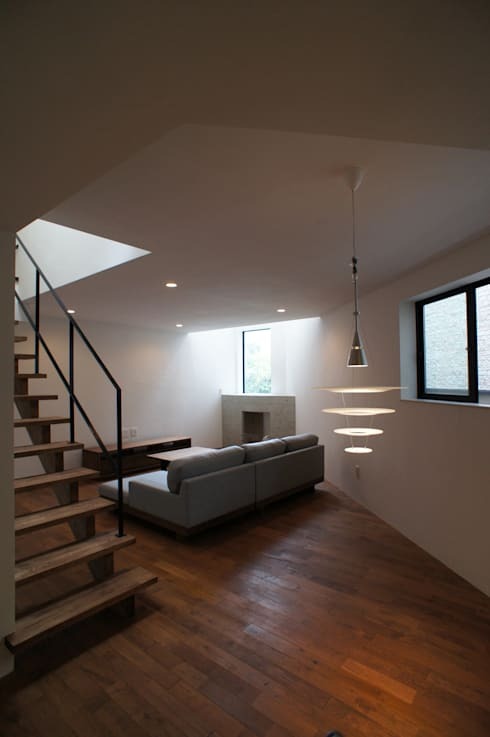 This perspective gives us an idea of the other side of the house and its brilliant evening illumination! It's an elongated window, but adds a different dimension to the overall experience. 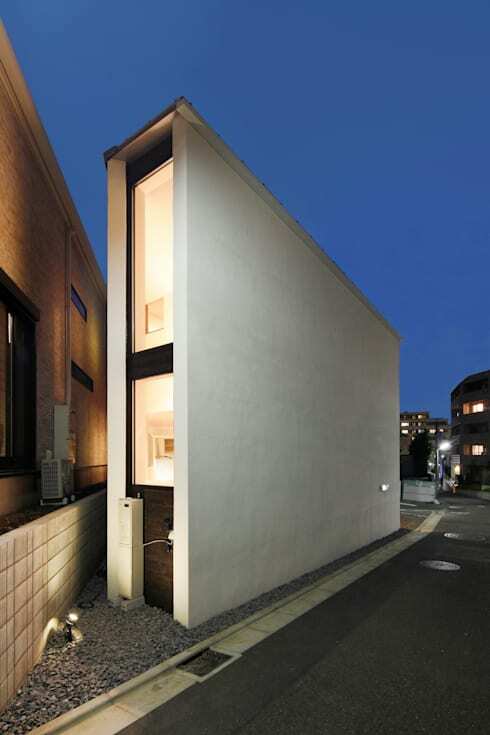 The Japanese home design is really taking off in the architecture industry. 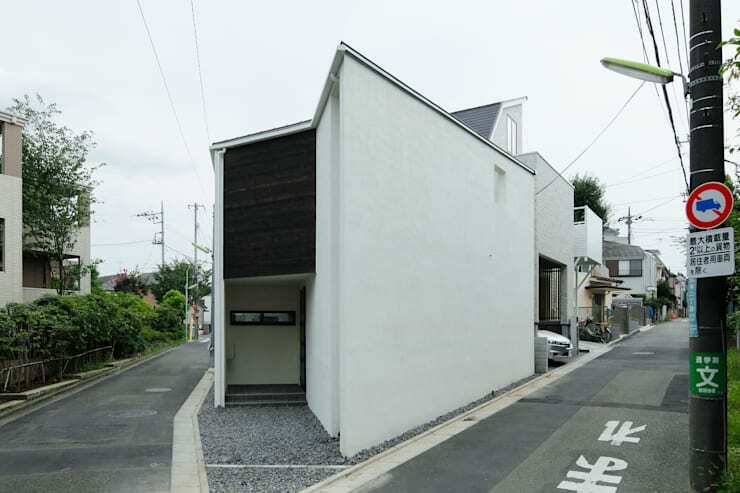 We adore the simplicity and stylish atmosphere that this house exudes, from the unusual exterior to the minimalist interior, but for more Japanese inspiration, have a look at Exposed Concrete Comfort! Is this modern style inspirational to you? What do you think of this house? Let us know!